This is a heavier fermented tea, so it fits the more traditional ripe pu-erh flavor profile. 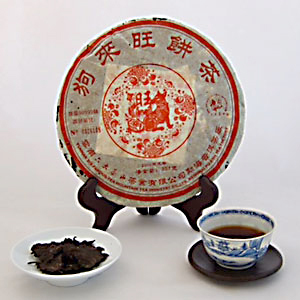 If you enjoy traditional processed pu-erh, you will like this smooth, mellow, and woody tasting pu-erh. In addition, the flavor and mouthfeel of this tea is very stable; whether you drink it hot, drink it cold, or drink it the next day, the flavor remains unchanged. The sweet aftertaste further adds to the enjoyment of this tea. Use 5g of leaves per 6g of water. Use boiling temperature water (212 degrees F) to quickly rinse the leaves and discard the water. Begin steeping the leaves according to the suggested times below.